Where were you born? What did you like as a child? Where did you go to school? These and other questions can get the conversation started for a successful interview, but an interview is about more than just the questions you ask. Planning and organization are the tools that enable an interviewer to get the most benefit from his limited time with his interviewee. Your students can achieve success as interviewers and get language practice in the process. Read on to find ways you can help them make the most of their interview opportunities. Interviews appear in many different formats. Some forms may be more familiar to your students than others. For example, they may have seen someone interviewed on the daily news, but have they seen a celebrity interviewed on a talk show? How about interviews on sports shows? Have your students read a printed interview in a magazine? Start your lesson on interviewing by discussing with your students the many people who are interviewed. Where might those interviews appear? When your students see an interview, do they prefer a video interview or a written one? Give your students some examples of interviews from a magazine (either for children or for adults) and through video clips. What types of questions do the interviewers ask? Getting the discussion started this way will help your students focus on writing better questions and directing a more interesting interview once they meet with their interviewee. Before you go very far with your interview unit, take a few minutes to do a grammar and vocabulary review. Make sure your students know how to ask questions, are familiar with the vocabulary words interviewer, interviewee andresponse, and phrases like grant an interview and conduct an interview and the difference between them. It is also beneficial to spend a few minutes clarifying for your students the difference between an interview and a conversation. In a conversation, two or more individuals participate and share equally in the process. For an interview, two or more individuals participate but one person is primarily seeking to get information from the other(s). When a person grants an interview, the interviewer must show his appreciation through his conduct and manners throughout the interview. Ask your students what might constitute good interview manners. You can look for answers like not taking too much of the interviewee’s time, being organized, shaking hands at the beginningand saying thank you at the end, listening carefully and taking notes when appropriate, and sending a thank-you note. If an interviewee has a good experience with someone, he is more likely to agree to another one later down the line. Before asking your students to conduct an interview, they will need to prepare so that the interview is successful. Have them think about what type of information they want to get from the interviews. They will be using this information more extensively later, but upfront they should consider their purpose in gathering the information. Are they going to be writing a piece about the people whom they are interviewing? Are they doing research about a particular topic, and are they interviewing experts who can give them useful information about that topic? Are they interviewing a person to determine if they are appropriate for a position they are trying to fill with either an employee or a volunteer? Knowing the purpose of an interview will help your students select the best questions to ask and help them direct the conversation once they get started. Good resources for interviews might be parents, classmates, students in another grade, teachers or school employees. As your students prepare their interview questions, have them write at the top of their papers the reason for the interview so it is always at the forefront of their minds. If you are doing your interview unit early in the school year, the purpose may be to introduce their partner to the other students. If you are doing research, a student may interview another about his native country to gather information for a report. Either, keeping the focus on the ultimate reason for the interview will make sure your students’ questions are useful and to the point. Start formal interview preparation with your students by brainstorming some questions. The first step in the brainstorming process is to write the purpose of the interview at the top of the paper. Your students should always keep the purpose in mind when writing their questions. You don’t want them to get too far off the topic and waste their limited time. Then have your students start listing questions. Encourage them not to worry about which questions are good and which aren’t good or the order in which they list the questions. Once each student has a list of about twice as many questions as they will need, have them go back through and eliminate the ones that are not as good. Now it is the time to organize the questions. ✔ Start with informational questions which will be easiest to answer. These types of questions help get background information and break the ice. ✔ Then move on to understanding questions, that is, questions that help you understand what the person does and why. The answers to these type of questions will be more personal than answers to the information questions but not as personal as answers to the last type of question, opinion questions. ✔ The most personal questions are the opinion questions, the ones where you ask how a person feels about a particular thing. They may can emotional answers that make the interviewee mad or sad, so save these questions for last. The interviewee will be more comfortable answering these types of questions after you have established a good rapport. Now the time has finally come to conduct the interview. You may want to give your students an example either through a video or by conducting an interview with someone in front of the class. You can demonstrate with an interview with one of your students or another teacher. If your students will be interviewing each other, give them class time to conduct their interviews. If they will be interviewing outside of class time, you may want to permit them a practice run on one of their classmates. Remind students that they should take notes throughout the interview and always keep their final purpose in mind. After your students have completed their interviews spend a little class discussion time to talk about the experience. What went well?What didn’t go so well? What was easy? What was difficult? What kinds of answers did you get? After the debriefing period, it is now time to put the information your students acquired in their interviews to their final purpose. Your students may be writing a report or doing an oral presentation. If the former, you may want to clear a bulletin board for them to display their interview notes alongside their final papers. If the latter, permit your class to ask of each presenter any questions they have about the interviewee or the information from the interview. 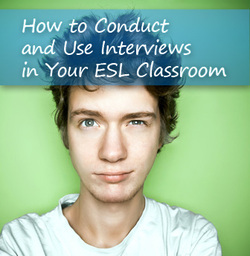 Interviews can be a great resource for writing, speaking and listening practice in the ESL classroom. If you ask, the benefits your students receive from conducting an interview will come. During the course of Collaborative Learning and New Technologies, a collegue tried to apply the technique of interview with expert concerning the question "What must happen on the level of educational policy in order new technologies to be widely intergrated in education?". As an expert of new technologies, Katerina Makri was chosen. Questions were gathered in wiki by other colleques. This attempt was successful, since all questions were answered, covering oure queries.